Heat the oil in a medium skillet over medium-high. Add the leeks and saute until they soften, 3 minutes. Spoon the mixture into a slow cooker. Back in the skillet, add the sausage and brown, breaking up with a wooden spoon, until cooked, 6 minutes. Add the sausage to the slow cooker. To the slow cooker pot, add the beans, tomatoes, broth, crushed red pepper, paprika, cinnamon and nutmeg. Set on high for 2 hours. At the 2 hour-mark, add the Swiss chard and let simmer for another 2 hours. Taste and season with salt and pepper if needed. Serve her up and dive in! Add grated cheese or scallions if you desire. Guess what makes me giddy to the max? I'll tell you. SET IT AND FORGET IT MEALS. And guess in what form? SOUP. And guess what else? I HAVE ONE FOR YOU. 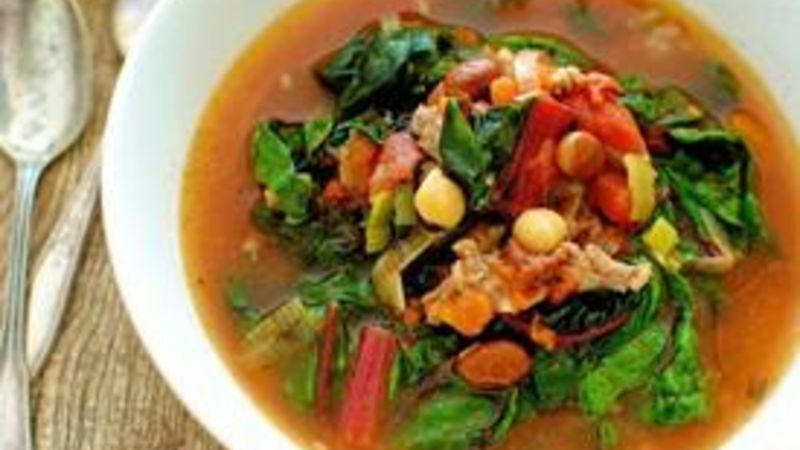 Let's put our hands together and welcome … the slow cooker Christmas Kitchen Sink Soup. Aaah, the slow cooker. How I love thee. The slow cooker graciously allows you a shameless round of fridge and pantry diving, tossing in whatever sounds good/you need to get rid of. And as the hours pass and you whizz by blowing kisses to the machine doing all the work so that you can watch Friends reruns, you're left with an astoundingly complex and wondrous result that will have your family begging to pamper you out of gratitude for making their faces so happy. For this specific Christmas Kitchen Sink Soup, I tossed in spices like cinnamon and nutmeg to give it more of a HO HO HO!!!! feel. It was the right decision in my life. I chopped up some leeks into teeny half moons. This is my aromatic. You can use onions if that's watcha gots. Grab some beans from the CUP BOARD. (That word cracks me up.) I used red beans and chickpeas this time around. Grab some Muir Glen fire roasted tomatoes. Seriously. I love these. They add just the right HEAT to the soup. And one of my favorite winter lettuces, the Swiss chard. It's SUPA healthy and in the slow cooker gets SUPA silky. Start by sautéing the leeks with some garlic in a skillet. The smell of heaven. Add some good Italian sausage and cook until browned all over. Dump it all into the slow cooker. Then add the tomatoes, beans, some good Progresso chicken broth, and your spices. Oh heavenly day. Simmer it on high for a good 2 hours. Then add the swiss chard. My. Goodness. Simmer it on medium for 2 more hours. Every half hour or so, taste it. For the sake of your taste buds and inner happiness, taste it and see what it needs. Even if you just need to taste it because you can't help yourself. After 2 hours, ladle out a good helping for yourself. Inhale. Repeat as needed. You guys, I can't even tell you the backflips your belly will do once a tablespoon of this soup hits it. Bev thought about crawling into the slow cooker to perfect her swimming skills, but decided 3rd degree burns aren't very becoming. For more musings, visit her blog at Bev Cooks (www.bevcooks.com) and her Tablespoon profile.